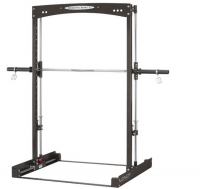 Build a better physique with this FTX functional trainer by Inspire Fitness. Constructed of heavy-duty steel finished with a matte black powder coat for durability, this trainer boasts one of the industry's smallest footprints. 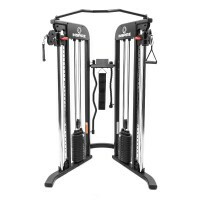 Two simple 165-pound weight stacks and 30 swivel pulley positions deliver versatility for unrestricted exercise. The Freedom of a Power Rack with the Safety of a Smith Machine! Our patented barbell motion provides for an almost unlimited array of exercises. Smith Machines only move vertically, not allowing for natural body movement. The Jones moves both vertically and horizontally, allowing for unlimited, user-defined motion. Because the body’s natural movements can be utilized within the Jones, all free weight exercise can be performed.